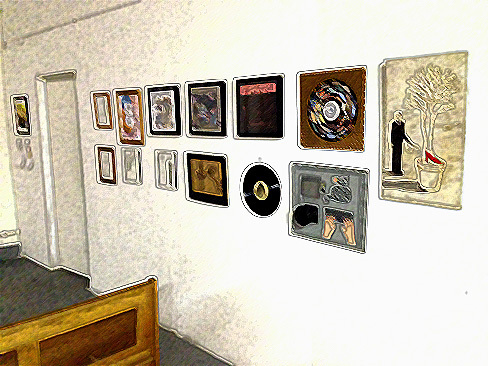 L.A. RECORD art show – sneak peak this Sunday at A Rrose in a Prose – A RROSE IN A PROSE REVIVAL! Besides our fantastic authors and poets, etc, this Sunday’s A Rrose in a Prose will also be featuring a sneak preview of paintings, drawings, and photos by some of L.A. RECORD‘s very best artsy types. Soon to be exhibited at a more gala event in a few weeks, you can see the art now if you so desire, simply by showing up to the FREE lit/spoken word event happening at the Pickle Factory. Some of it has appeared in print in L.A. RECORD, some of it is at the discretion of the artists, and all of it is pretty damned good (and for sale–including renderings of your favorite bands and albums). Previous Post New A Rrose in a Prose coming up! Next Post A fantastic Rrose in a Prose today!